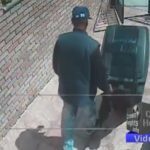 A notorious package thief – who was once arrested by the police – has been at it again, this time stealing a package worth over $800 on Carroll Street. Surveillance video revealed why a Carroll Street resident had been waiting for their packed for over a month. 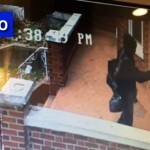 The suspect, who bears a very clear resemblance to the thief responsible for a sting of thefts on the same block a few months ago, walks up to their front door and casually walks away with the large box. Passersby can be seen in the video walking by completely oblivious to the theft taking place right before their eyes. 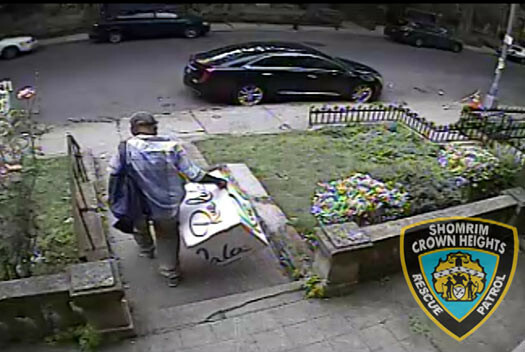 The victim told CrownHeights.info that she had order merchandise worth over $800 at the end of June and when July came and went she was left wondering where her package went. Spending the summer months upstate she asked her husband to check the cameras and they quickly discovered the theft nearly three weeks later. and *this* is why I have my surveillance system set up to send me a text alert when motion is detected. sure, I get a bunch of false alerts, but it’s nice to know when someone approaches my home when i’m away. This guy supposedly received ‘therapy’ after his first arrest. Time to stop being politically correct and throw him in jail. Whats politically incorrect about throwing a thief in jail? And if your statement is about him being a black man, then certainly, you know America has no pc discretion when it comes to that. Don’t you? Packages should not be allowed to be left like that! I would sue the delivery company for leaving packages when no one has signed for them!!! No – it’s disgusting that innocent people can’t live normal lives because scum is allowed to roam our streets. Where is Gulliani. This criminal was arrested before. Now lock him up so he can’t strike again. That’s terrible. But if your not going to be home all day every day, have package dropped off by some one who usually is home. Get someone to take in your packages – or neighbors, if you see one on a porch, take it in & leave a note. My neighbors & I did that for years! someone should put a stink bomb inside a box and have him take it and explode as he opens it!!! What normal delivery service leaves an $800 item unattended at someone’s door? Called slice that reads your mail and informs you exactly when your package is set to be delivered so that you can make sure someone is waiting for it. On which block on Carroll St. did this happen? I had 2 packages “delivered” (according to tracking updates) by USPS on President St. btwn Kingston & Albany last week at 1:38pm, but when I arrived home an hour later they were not there. I had assumed that they were delivered to the wrong house since USPS is so unreliable around here, but now I’m wondering if they were stolen. We can’t leave anything unattended on the property – time to have a street patrol 24/7 in all CH . Time to keep our streets clean and safe …. What is it – you can’t have a package next to the door , you can’t walk safely In The streets home in the middle of the day or after Simha / farbrengen ….. Wake up CH …. This one must stay at jail for max time …..all others must be aware of punishment for any crime in Jewish district of CH …..police camera must be installed too in any comer …. moved there from up kingston ave near essen bentch . when i lived in the hood… there was a package wrapper and fedex shipper just up the block from the butcher…..on kingston…i just took a look on google and saw crown heights shipping and copy center on albany..(forgot about them)….i am quite certain that for a small fee they will assume responsibility for your package until you can pick it up….i find it quite unlikely that a delivery service left $800 worth of merchandise at the door……. Maybe a neighbor needs to take the package so that thief’s like this person gets nothing. This is very bad for frumme yidden. Jews are robbed blind left and right and apparently this is a very normal thing in Crowhnheights. there are many people having this. I wonder if they can all register somewhere just to see how many people it is. I have been hearing it alot, and I don’t think that everyone reported it, so it is bigger than we think. Its been over a year, too. Time to stop this thievery.